I have build myself a receive system for DL0SHF. 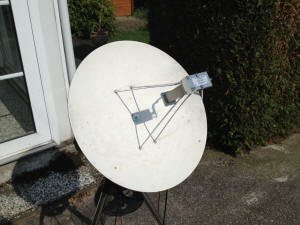 In november 2014 I started with a new setup using a PLL LNB and a 60 cm offset dish, more info will follow as I am proceeding. 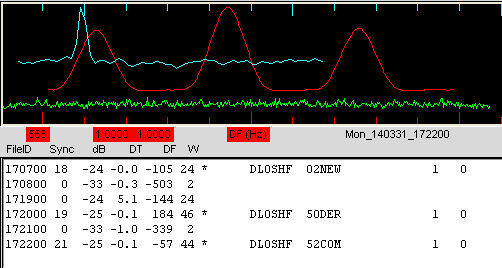 My Receive system is based on a 48 cm Procom dish, a DB6NT pre-amp with 0.7 dB nF and a DB6NT transverter. 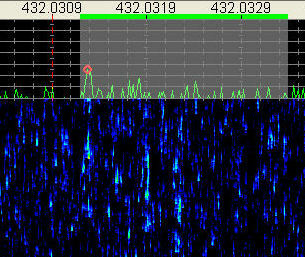 Today 30-3-2014 I received DL0SHF beacon with my new setup. 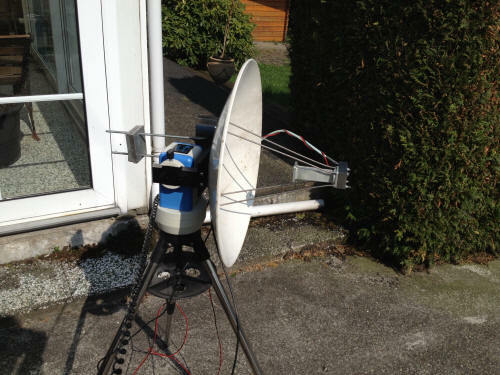 It was performing better than my previous setup with a 50 cm dish being my portable station and not as well defined for EME. Take a look at my system. 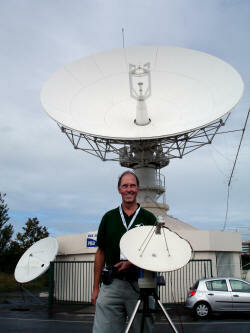 I use a small gearbox from IOPTRON designed for small astronomical telescopes. 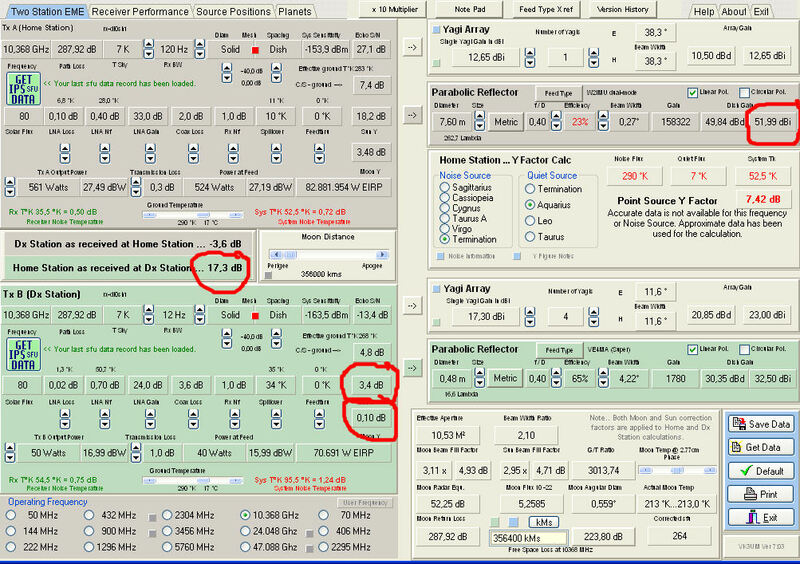 main advantage, it has all calculations available for moon and sun positions. 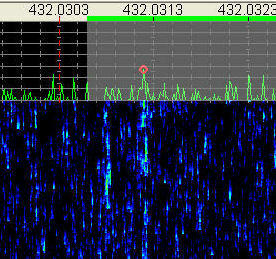 The second demo for receiving DL0SHF on low power was cancelled due to the rain. This presentation was for me as well as for big number of conference participants the most interesting lecture at French EME meeting. 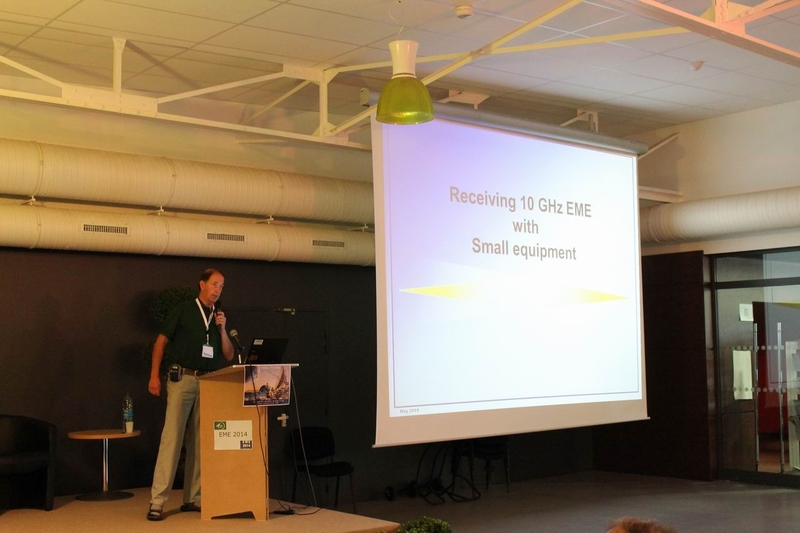 Hans, PA0EHG presented possibilities of receiving EME signals with subminimal setup for 10 GHZ band, which in this case was only 48 cm diameter dish with LNA at feed, transvertor and SDR RX for IF. 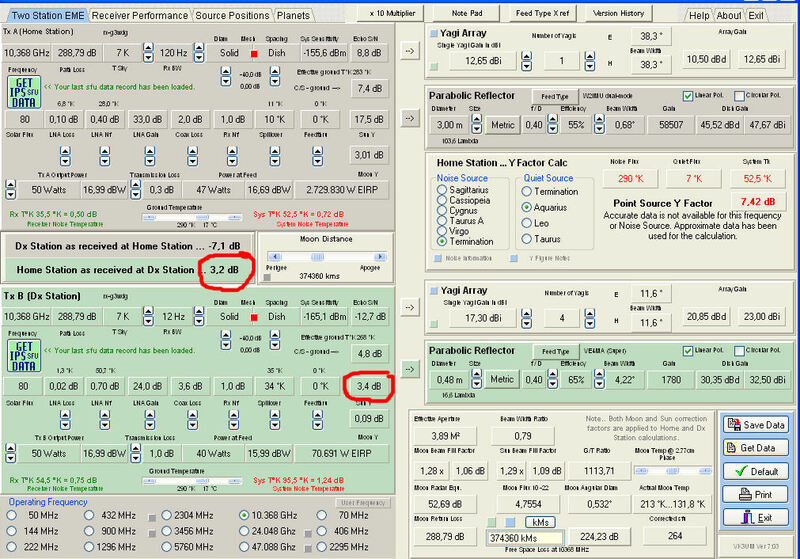 This has been possible mainly thanks to DL0SHF's QRO beacon which is on air since December 2013 and use 7,6 m dish with 50W TWT PA including the possibility (on request) to increase RF power output up to 550W (!) out. 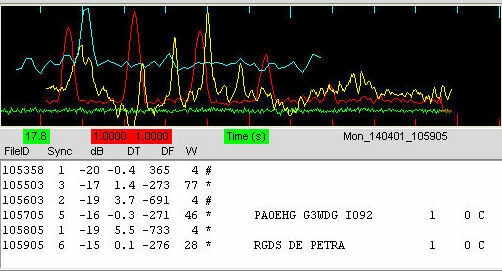 Hans introduced in the lecture program SpectraVue Ver 3.15, which he found to be the best program for detection of the weakest signals EME, played audio recordings of the tests with DL0SHF and prepare for the next day live demonstration of EME signal reception on DL0SHF's beacon in front of PB8 telescope. 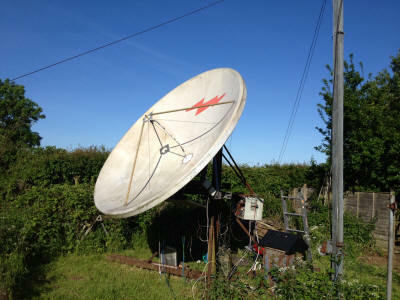 The weather finally got better for about 3 hours so everyone interested could listen to live 3 cm CW EME signals from a 48 cm dish by it's own ears. The most important conclusion of the lecture was that the biggest problem is the proper alignment of the antenna to the Moon. Hans used smart solution of this problem by using digital rotator unit, which is manufactured for automatic rotation of small astronomical telescopes, including GPS receiver. 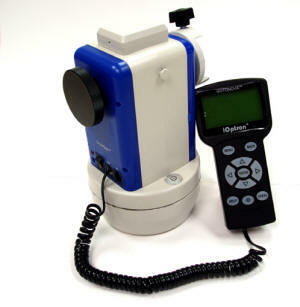 This small rotator can be bought for 200$ (a version without GPS for only 100 US dollars). 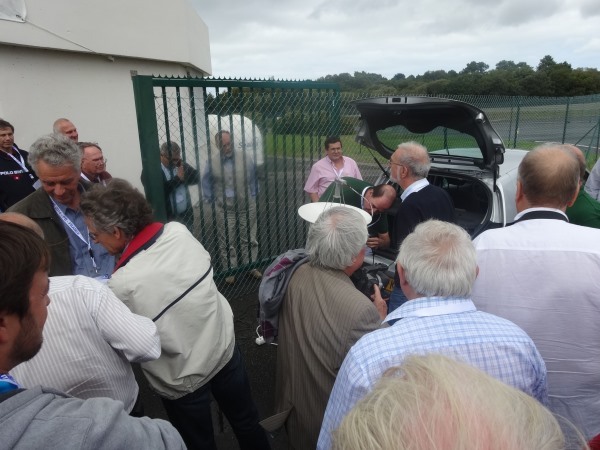 Lecture and successful demonstration of PA0EHG's small 3cm EME station in front of the conference house was met with great interest and it is likely that it could result in increase of the active EME stations on this interesting EME band. These are the calculations of the VK3UM calculator. 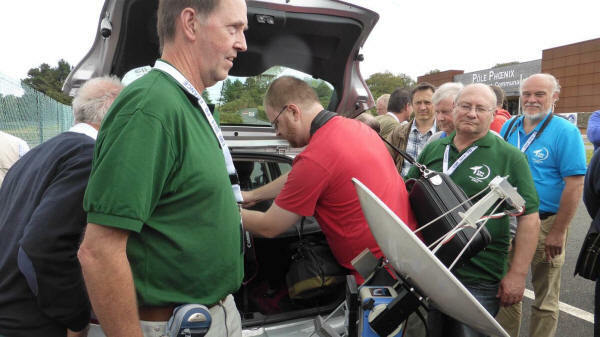 as stated in the article "what's different on 10 GHz EME"
Reason for this is that the antenna from DL0SHF is that big that it's beam only hits part of the moon.